ASUS announced ProArt Series PA238Q, a new IPS screen that promises total color fidelity. The 23" panel offers 100% of the sRGB color space with factory calibration, 250 nits brightness, 1000:1 contrast ratio, 178/178 viewing angles, 6ms gray-to-gray response time and a power consumption of under 58W (typical <33W). Inputs include DisplayPort 1.1a, HDMI 1.3, DVI, and D-sub, and there's also a 3.5mm jack. The monitor stands supports 90° clockwise pivoting, +60° to -60° swivel, +20° to -5° tilt and 0-100mm height adjustment. 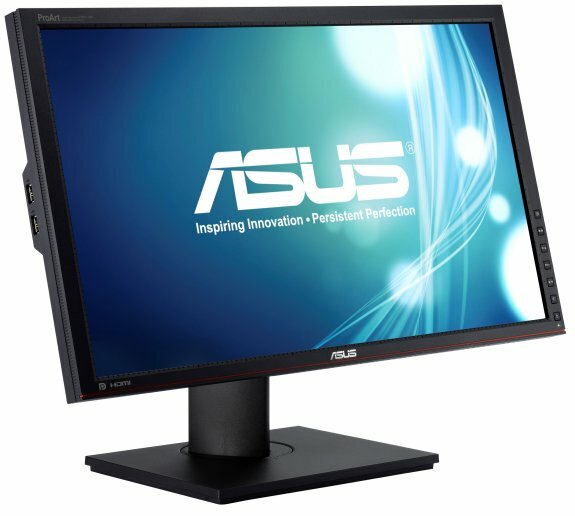 Created to meet the needs of graphic designers and other professionals, the IPS-paneled ASUS PA238Q joins the ProArt Series of displays as a 23”, LED-backlit model with native 1920 x 1080 resolution. It reproduces 100% of the sRGB color space, with every individual monitor precision calibrated at the factory to ensure unmatched color accuracy. The PA238Q ships with ASUS-exclusive QuickFit Virtual Scale software to display photos and documents in their true size on screen. In terms of ergonomics, a fully adjustable and sturdy stand complements a wide I/O range, which includes HDMI, DisplayPort, DVI-D, D-sub, and multiple USB ports. Guaranteeing authentic color performance, the PA238Q’s IPS panel is capable of delivering 100% of the sRGB color space, a feature pivotal in professional graphics work. IPS technology allows for 178ﾟviewing angles, preventing color loss and wash even from extreme vertical and horizontal viewing directions. Precision individual calibration at the factory guarantees an average delta E factor lower than 5 for improved color fidelity. The internal firmware of the PA238Q uses a 10-bit lookup table for RGB coloration, going beyond the standard 8-bit table used in conventional monitors. This results in smoother and more accurate color gradation and reproduction. The contrast ratio comes in an incredible 50,000,000:1, generating true dark/light distinction and spectacular image quality. Combined with a 16:9 screen ratio, these features make the PA238Q a very capable monitor for entertainment applications such as movie viewing and gaming. ASUS bundles exclusive QuickFit Virtual Scale functionality with the PA238Q, powering true-sized displays of photos and documents on the screen. Format sizes supported by the software include A4, letter, 8” x 10”, 5” x 7”, 4” x 6”, 3” x 5”, and 2” x 2”. It also supports alignment, centimeter and inch-based grids for added flexibility. Users can activate QuickFit via a simple hotkey at any time. This goes along picture-in-picture and picture-by-picture viewing for easier multitasking. Additionally, the PA238Q’s stand integrates fully-adjustable height, tilt, swivel, and pivot, making for easier work and enjoyment. The four conveniently-located USB ports on the PA238Q (two on the side, two on the back) afford easy access to a wide range of storage devices and file formats, helping users display content instantly. As a fully-featured high-end monitor, the PA238Q offers a complete port and connector array. HDMI makes it effortless to insert the PA238Q into any modern multimedia and content sharing setup, while the inclusion of DisplayPort, DVI-D, and D-sub maintains connectivity options with a wide range of devices so consumers can use the monitor as a single display for multiple sources.